Hard hit by Russia ban on EU produce, Lithuania authorizes kosher and halal ritual slaughter amid general European push against kashrut. Lithuania authorized Tuesday the Jewish ritual slaughter of livestock for food according to kashrut (Jewish dietary law), seeking Israeli and Arab halal markets for exports after Russia embargoed EU products amid a sanctions war sparked by the Ukraine crisis. 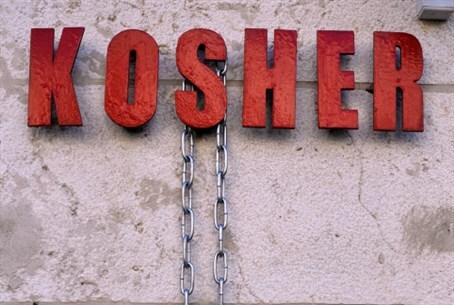 Under the new law, which comes into effect in 2015, animals can be killed in the ritual process for kosher meat. Many European countries including Poland, Denmark and the UK have been working to ban the process claiming "animal cruelty" in a push for stunning the animals before slaughter - a process many argue causes much more pain and suffering. Lithuania's move may have more considerations than religious freedom going into it, though, as the European Bank for Reconstruction and Development recently singled out Lithuania as being the most vulnerable EU member to the Russian embargo. Moscow leveled the ban in August in retaliation against US and European sanctions over Moscow's support of military action by pro-Russian rebels in Ukraine. Fifty-seven members of the Lithuania's parliament backed the move after the heated debate - four voted against and 11 abstained. "The new law allows us to start talk with Arab countries over our meat exports. We are also in talks with Israel," Agriculture Minister Virginija Baltraitiene told AFP after the vote. Baltraitiene said the Russian meat ban could cost Lithuanian business up to 87 million euros ($111.7 million) by the end of this year if the exporters failed to find the new markets. The leader of Lithuania's Jewish community, Faina Kukliansky, welcomed the move, telling AFP that it was "very important to Lithuanian Jews" amid a revival of their cultural and religious life in country, which had a large and vibrant Jewish presence prior to the Holocaust. The Jewish and Muslim communities each number around 3,000 people in the Baltic nation of three million, which joined the European Union and NATO in 2004 and will join the eurozone in 2015. The Russian food embargo includes imports of meats, fruit and vegetables, fish, and dairy products from the European Union, the United States, Australia, Canada and Norway. Set to last for a year, it covers one fifth of Lithuania's exports to Russia, or around 4% of total exports. Blaming the ban, Lithuania's central bank has cut the country's 2014 growth forecast from 3.3% to 2.9%.